Zero Hedge: Goldman Sachs Principal Transactions Update: 1 Billion Shares! "ON A LONG ENOUGH TIMELINE, THE SURVIVAL RATE FOR EVERYONE DROPS TO ZERO"
Goldman Sachs Principal Transactions Update: 1 Billion Shares! This is getting surreal. Goldman principal program trading is now well over 5x compared to its customer and agency trades and a 150 million share pick up compared to last week. 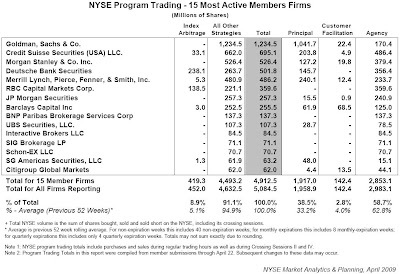 For yet another week, Goldman's principal trading represents more than half of all NYSE member firm principal transactions. The people demand Cuomo and an end of market manipulation. Will Late Sunday Be D-Night for Vikram? Is there a bubble forming in copper? Is the Fed going to buy more bonds next week? So The Treasury Was Lying After All? "The Risk Of Deleveraging Only Gets Larger"
Disclaimer: nothing contained anywhere on this site constitutes any investing advice or recommendation. Any purchases or sales of securities are solely at the discretion of the reader.